I get tremendously affected when people I have some kind of relation to die too young. Particularly when they are brilliant but troubled. I cried like a baby when Michael Jackson died, a deeply problematic genius in his field. I wrote a reflection on him and his work and speculated about the future of superstars in the digital network society. The superstar - dead for ever? was the translated title. I wrote in Swedish. Today I have shed tears over Aaron Swartz, when his name was popping up everywhere. 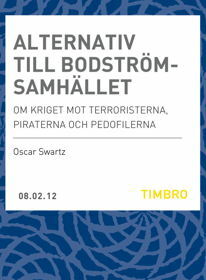 [Yes, I am Oscar Swartz, but there is no relation that I know of]. He apparently hanged himself at the age of 26 in his Brooklyn apartment. About a year ago I used my monthly column for IDG/Computer Sweden to write about the lawsuit Aaron Swartz was facing by the U.S. government for having wished to open up academic articles to the public. I demanded that "academia be liberated from over-profiteering intermediaries". Academic publishing must be revolutionized and the knowledge that is produced in universities must be let free! For pieces about the death of Aaron Swartz, check out Wired and New York Times . To see more about the "crime" he was a suspect of and which could give him 35 or even 50 years in jail, read this piece from expert witness Alex Stamos in the case: The Truth about Aaron Swartz' "Crime". His "crime" was heroic. I wish to share a picture I took 6 years ago, in january 2007. Aaron Swartz and other international net activists had attended 23C3, the 23rd Chaos Communications Conference in Berlin. I was there also. Some americans decided to go to Stockholm on the way back. Sweden was (in)famous for its vivid scene and activism for an open and free internet. 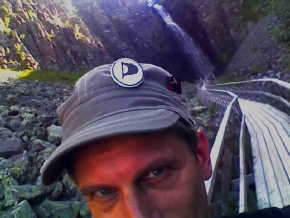 We had the Pirate Bureau, The Pirate Bay, The Pirate Party. I took some pictures at the dinner. 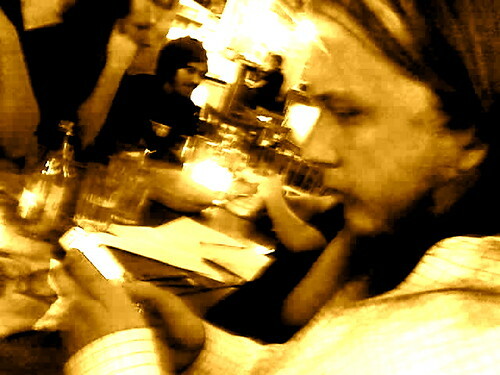 Here is one with Gottfrid "anakata" Svartholm Warg in the foreground and Aaron Swartz in the background. The former is in prison in Sweden, after three months in solitary confinement. The latter is dead. As a tribute to Aaron Swartz's work for academic freedom of information academics have now started posting their work as open access under the hashtag #pdftribute on Twitter. Wall Street Journal writes about it. I was surprised to see Swedish newspapers covering this tragic event. Aaron Swartz was not exactly a household name. It seems that TT, the Swedish news agency, sent out an article that was taken up by several papers, e.g. SvD, AB, DN. Jag brukar inte vara språkpolis utan tycker att språk utvecklas evolutionärt men visst kan man ha synpunkter i alla fall. Måste säga att rubriken hos Sundsvalls Nyheter är ful och fel: "Känd nätaktivist tog självmord". Man tar inte mord och självmord. Man begår. Ett liv tar man dock. Och man tar livet av sig.